I will bite the bullet and share this with Craftyhazelnut's CHNC 361 Christmas challenge, where the option is to use a doily. Have fun and make it a great weekend too! Carol, this is far from a blunder! When you said about a boo boo I looked and looked and could not find anything so I read farther. Still it did not look wrong to me and I love how you created the holly wreath! Great choice of colors, too! Looks wonderful to me and the embossing ties it all together! I say, keep it! Looks perfect to me! Lovely card, Carol, and I'm sure it took you a long time to do. I read your comment about making a mistake...so I enlarged your card to see if I could see it...Nope! It wasn't until I continued reading your comments about the holly leaves and I still don't think of this card as a mistake! I did not see anything wrong with it. I think it still looks so beautiful and I can see you put lots of hard work into it. It never occurred to me that the leaves were placed wrong. So you should have not mentioned it as we would never have known. A super Christmas card Carol, I have to agree with the others - I couldn't see anything wrong with your card until I read your entire post, it looks fine to me. Even after reading your post it took some time to work out what was 'wrong'. It's a terrific snippets card, and until you mentioned the placement of the holly leaves, I didn't notice anything except it is a beautiful wreath. Even after you pointed out what you think is wrong, I _still_ think it's a lovely wreath. 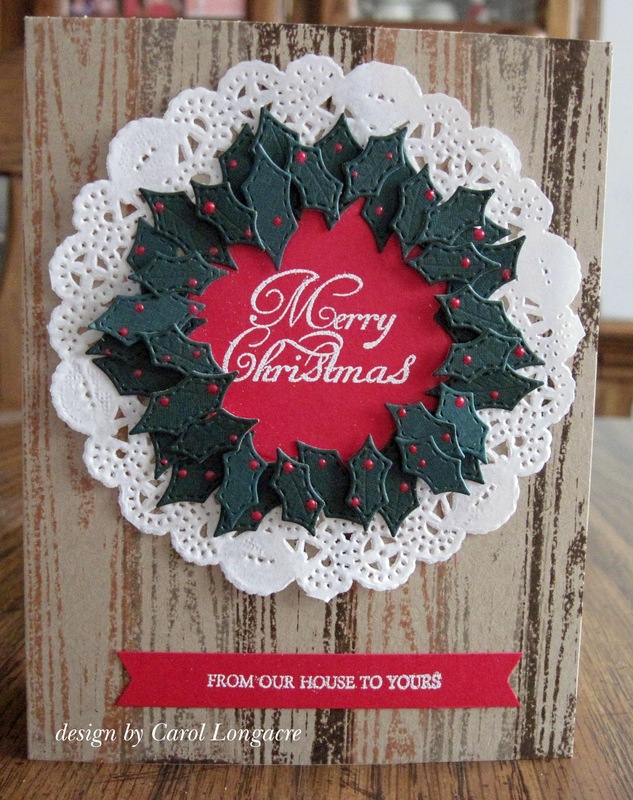 Love the layering with the white doily and the green leaves with the holly dots. Anybody would be tickled to get this one! Only YOU know (or think!) you made a boo-boo. Also like the rustic wood planking with the delicate doily too. TFS & Hugs. Hope all is well. I like it done with the points in! It makes it unique! Far from an April Fools card, my silly friend! I think your leaf placement comes out looking gorgeous. This is a big full fluffy wreath. And honestly I had to read to find out what your blunder was because I sure couldn't see it. What I could see is this card was a lot of work. Looks beautiful to me!! I had to actually google pictures of wreaths made of holly to figure out what you meant. Not an Aprils fool card at all! I like it like this - it looks great.